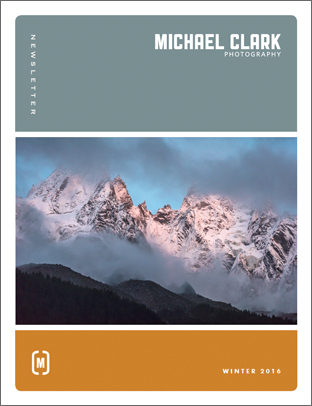 The Winter 2016 issue of the Michael Clark Photography Newsletter is now available for download. If you’d like to sign up for the Newsletter just drop me an email and I’ll add you to the mailing list. This issue includes an editorial about my latest travels and purchasing a new Hasselblad medium format digital camera system, a review of the G-Tech G-Dock ev, an article detailing an assignment for Elinchrom last fall shooting BMX, an editorial entitled “Standing Out,” and much more. If you’d like to check out back issues of the newsletter they are available here. Please note that the newsletter is best viewed in the latest Adobe Acrobat reader which is available for free at www.adobe.com.